The life of Saint Anthony The Great, our Patron Saint is a great example of Christian piety, asceticism, and true love for his fellow men. Here was a man who was raised by rich and noble parents, yet he found himself compelled to obey Christ’s command in St. Matthew’s Gospel 19:21: “If you wish to be perfect, go, sell your possessions, and give the money to the poor, and you will have treasure in heaven; then come, follow me.” Saint Anthony did precisely that which our Lord asked of the rich young man to do: he gave up all his possessions and retired in the Egyptian desert to live a life of self-denial and solitude. While in the desert, Saint Anthony preoccupied himself with prayer and study. Before teaching himself how to read and write, it is said that he memorized most of the Sacred Scriptures simply by having other monks read God’s Work him! Because of the great respect that the entire Church had for him, Saint Anthony was invited to attend the First Ecumenical Council in Nicea in 325 A.D. Although he held neither title nor power, he was called upon to give a defense of the Orthodox faith concerning the Divinity of Christ against the Arian heresy. 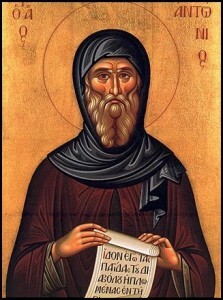 Saint Anthony died in 356 A.D. at the age of 105 in his beloved desert monastery.